In the spring of 1989 James Freeman showed this face mask to Evan Turner, then Director of the Cleveland Museum of Art (CMA). In a May 1989 memo, Turner reports that Freeman attributed the mask to Sebarikwo [Sabariko] on the basis of the object’s stylistic correspondence with a face mask published in Anita Glaze’s May 1986 African Arts article, “Dialectics of Gender in Senufo Masquerades.” Thus, attribution of the face mask now in the CMA’s collection to Sabariko, an artist from the town of Ouazomon, rests on formal comparison of the face mask in the CMA’s collection with the mask reproduced in a single photo. Like the face mask then in Freeman’s collection, the face mask reproduced in Glaze’s article features a smaller face with projections above the mask’s larger main face. Glaze’s caption describes the object in the photo as a “face mask, possibly made for the Kulebele (woodcarvers) poro, carved by a master sculptor of the Boundiali region, Sabarikwo of Ouazumon [Ouazomon].” Her caption continues to explain that the artist “was working at least as early as 1900, traveled widely throughout the region, and his sculpture was prized in many different dialect areas.” She also notes that the mask in the published photo measures 33.6 cm in height and belonged at the time to a private collection (1986: 32, Fig. 2). The Ouazomon artist’s name appears in other publications and is linked to other objects. Glaze (1993, 2: 17, cat. 10) identifies a wooden cap with the artist, and she separately refers to another sculptor “of the same age class as the famous Sabarikwo [Sabariko]” (Glaze 1993, 2: 24, cat. 20). In a different publication, German collector Karl-Heinz Krieg (2002) recalls his conversations with people in northern Côte d’Ivoire who remembered the artist he identifies as Sabariko Koné of Ouézomon [Ouazomon]. Krieg attaches the name to various sculptures but no face masks, and none of the sculptures he links to the artist bears features we immediately relate in form or style to the features of the face mask in the CMA’s collection. According to Krieg, Sabariko Koné belonged to a group of carvers known as kulebele (pl. ; kule, sing.) and died around 1950. Krieg (2002, 28, fig. 7; 52, figs. 39-40; 72, fig. 76) attributes to the artist a male-female pair of figures, each nearly four-feet tall, as well as a finial in the form of a seated female figure and a helmet. Krieg’s writings suggest he obtained specific information about objects he amassed during his travels in Côte d’Ivoire. Krieg (2002, 30) writes that Sabariko Koné earned renown across northern Côte d’Ivoire. Citing conversations with Zonvagnan Koné, a kule carver born in 1930 in the town of Kolia, Krieg identifies Sabariko Koné as Zonvagnan Koné’s uncle. Krieg further reports that Sabariko Koné established a carving center in the town of Ouazomon, located nearly twenty-five miles south of Kolia. According to Krieg, Zonvagnan Koné recalled working with his uncle at times using leaves of the Ficus asperifolia plant to clean and polish sculptures. Zonvagnan Koné also reportedly asserted that Sabariko Koné became famous and enjoyed more success than other carvers due to his attention to detail. Proficient sculptors may indeed create works that vary in form or style. For example, a 17 April 1988 New York Times report opens with a description of the artist Zana Soro, identified as Senufo, “carving a mask in the style of his rivals, the Baule.” Following from a meeting with sculptor Kouassi Koffi Joseph in Yakouakoukro in central Côte d’Ivoire, art historian Susan Mullin Vogel (1999, 50-51) reports the sculptor showed her twelve heddle pulleys and a figure that evinced a range in his oeuvre. She adds, “All his pulleys had a generic similarity when they were photographed, but I am sure that if one encountered them today, scattered in a dozen collections and displaying disparate patinas of time and use, it would be impossible to assert that all were by a single hand, much less to connect the figure to any of them.” And she describes having observed similar ranges in other artists’ sculptural ensembles. A carver named Sabariko may have produced works in a variety of forms and styles. But we must also consider that informants anywhere may also have had a range of reasons for reporting or confirming information. Their responses may depend on the individuals and contexts involved in the information exchange. Based on nearly four decades of research in northern Côte d’Ivoire, Till Förster (1997, 253-55) explains that each poro initiation cycle is shorter than seven years because lunar cycles govern the timing of initiation activities. Thus, each cycle is equivalent to about six years and two months on the Gregorian calendar (see also Boutin 2014). Boutin, Pierre. “Le Poro, système initiatique sénoufo.” Société des Missions Africaines, 2 June 2014. Accessed 2 June 2016. http://www.missions-africaines.net/le-poro-systeme-initiatique-senoufo/. Förster, Till. Zerrissene Entfaltung: Alltag, Ritual und künstlerische Ausdrucksformen im Norden der Côte d’Ivoire. Cologne: Rüdiger Köppe, 1997. Glaze, Anita J. Art and Death in a Senufo Village. Bloomington: Indiana University Press, 1981. Glaze, Anita J. “Dialectics of Gender in Senufo Masquerades.” African Arts 19, 3 (1986): 30-39, 82. Glaze, Anita J. “Healer’s society cap maps, nͻͻ.” In Art of Côte d’Ivoire: From the Collections of the Barbier-Mueller Museum, edited by Jean Paul Barbier, 2: 17, cat. 10. Geneva: Barbier-Mueller Museum, 1993. Glaze, Anita J. “Seated female figure.” In Art of Côte d’Ivoire: From the Collections of the Barbier-Mueller Museum, edited by Jean Paul Barbier, 2: 24, cat. 20. Geneva: Barbier-Mueller Museum, 1993. Krieg, Karl-Heinz. “Zur Kunst der Senufo in der nördlchen Elfebneinküste und im südlichen Mali.” In Afrika – Begegnung, Künstler, Kunst, Kultur, aus der Sammlung Artur und Heidrun Elmer, edited by Artur and Heidrun Elmer, 25–85. Viersen: Städtische Galerie im Park Viersen, 2002. The New York Times. 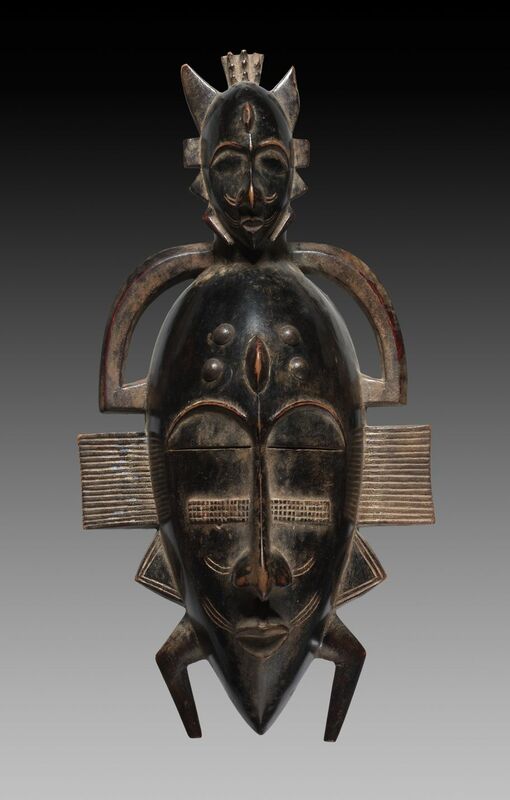 “Ivory Coast; Faced with a Shrinking Supply of Authentic Art African Dealers Peddle the Illusion,” 17 April 1988, http://www.nytimes.com/1988/04/17/arts/ivory-coast-faced-with-shrinking-supply-authentic-art-african-dealers-peddle.html. Vogel, Susan Mullin. “Known Artists but Anonymous Works: Fieldwork and Art History.” African Arts 32, 1 (1999): 40-55, 93-4. Gagliardi, Susan Elizabeth. Senufo Unbound: Dynamics of Art and Identity in West Africa, 152, pl. 103. Cleveland: The Cleveland Museum of Art; Milan: 5 Continents Editions, 2015. Petridis, Constantine. South of the Sahara: Selected Works of African Art, 42-43, pl. 6. Cleveland: The Cleveland Museum of Art, 2003. Young-Sánchez, Margaret. “The Cleveland Museum of Art.” African Arts 30, 1 (1997): 69. Gagliardi, Susan Elizabeth, and Constantine Petridis. “PREVIEW: Ouazomon: Face Mask Attributed to Sabariko (The Cleveland Museum of Art 1989.48).” In Mapping Senufo. Atlanta: Emory Center for Digital Scholarship, 2015–. http://www.mappingsenufo.org/archives/734 (23 July 2016), accessed 22 April 2019.